Toyota Motor Corp. will recall about 7,500 SUVs in its European markets to update the software on the cars' vehicle stability control systems. It is the same fix that Toyota has announced for the Lexus GX 460 in North America, the Japanese automaker said. In Europe, Toyota will make the software upgrade to reduce the risk of sliding when making sharp corners at high speed in some versions of the Toyota Land Cruiser 150, which is known as the Land Cruiser Prado in some markets, and the Lexus GX 460, the company said in a statement. The move affects 34,000 vehicles worldwide and follows Toyota's agreement Monday to a record $16.4 million fine in the United States. 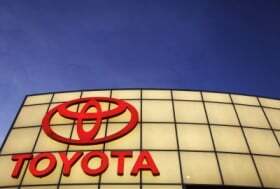 The penalty was levied due to Toyota's slow response in earlier recalls. The latest recall only covers left-hand-drive versions of the Land Cruiser and GX 460 in Europe. The GX 460 is only available in certain eastern European markets. Toyota Motor Europe said all customers owning one of the involved models will be personally notified in the coming days. To date, there have been no reports of complaints or accidents linked to this issue in Europe, the carmaker said. Toyota said the recalled vehicles are safe to drive under normal driving conditions, but vehicles equipped with the optional Kinetic Dynamic Suspension System could slide sideways when turning sharply at high speeds. "This is due to an insufficient activation of the VSC system when the vehicle is driven under certain extreme driving conditions," the company said. Toyota has been fighting to regain its once-sterling quality reputation amid a spate of recalls, which have ballooned to more than 8 million vehicles worldwide. In Europe, 1,687,000 cars have been recalled to check for a potentially sticky accelerator pedal and 53,000 Prius models have been recalled to check the ABS control software. Toyota has also been trying to be quicker in responding to safety issues. The latest global fix comes less than a week after Consumer Reports, an influential U.S. magazine, issued a warning about the Lexus GX 460 SUV, saying it may be prone to rollovers. The latest Toyota vehicles to be recalled include 13,000 GX 460 vehicles -- 9,400 of them in the U.S., 1,000 in Russia and 1,000 in Oman. Also affected are 21,000 left-hand-drive Land Cruiser Prado models globally, including 4,400 in Oman, 4,000 in Russia and 1,500 in the United Arab Emirates, according to Toyota.